Your Company picnic or special event can be an unforgettable day for even the youngest family member when you bring A Child’s Joy along for the fun! 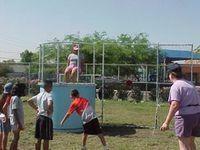 We offer the greatest variety of Quality Children’s Entertainment in the Valley. Our rides, entertainers and attractions create a festive atmosphere that promotes co-worker and family interaction. A Child’s Joy can make your work easier. We help you plan the best event for your business with just one phone call. No longer do you have to deal with several different individuals and companies to get a variety of entertainment; we do it all. Our staff is professional and courteous, our equipment is insured, safe and well maintained and our animals are clean, hand-tamed and well trained. On the day of your event wouldn’t it be nice to enjoy all the fun you planned instead of running around worrying if everything and everybody is doing what they’re supposed to be? When you use A Child’s Joy for all your entertainment, we take all the worry away! Plus, your dollar goes farther with A Child’s Joy because when you book several items or keep us longer you may qualify for multiple booking discounts or other volume pricing, call 480-820-8030 for details. We have a large selection of competitive games and attractions that help you plan a wonderful day of team building for your workplace. Sucessful companies know that getting the crew away from the office for a day of fun and games goes a long way to fostering good will amoung co-workers and relieving stress. Ask us for some great ideas! Want to promote "Take your Child to Work Day" and still get some productivity? How about an inflatable babysitter? 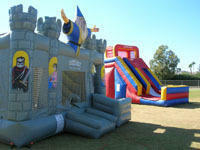 That's right, we can set up a Bounce House, Slide or other games that will give the kids a chance to blow off some steam. Let them bounce off our walls instead of yours! For a limited time book at least three rides for your event and receive a moon bounce at no additional charge. Special offer for Company Picnics or Special Events only. Offer expires 12/31/18. No more than one free moon bounce per event. Not to be combined with any other special offer or coupon. Moon bounce requires electricity. Customer is responsible for electricity and supervision. Length of free moon bounce limited to length of rides booked. To qualify for free offer, three rides booked must not include another moon bounce.